The “Aqua Vaccinium” WordPress theme was originally intended for use on a clients site, but they have since decided to go with a red theme and use Dreamweaver (ick!) 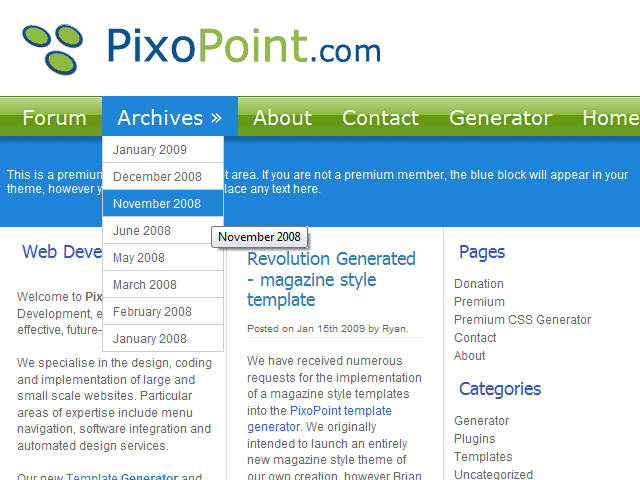 instead of WordPress, so we have decided to release this theme to you for free. Aqua Vaccinium features a smooth blue and green theme and has a prominent Suckerfish dropdown menu built in (no plugin needed). Nice theme, the top menu looks stylish. Keep up the good work. Thanks 🙂 The top menu took quite a bit of messing around to get it working cross browser. It can also be used as a standard non-dropdown menu. And very generous of you to release it for other to use too. You need to specify a category parent for the categories you want to appear in the dropdown. If you specify a parent of a parent then that category will appear as a flyout. For example, in the demo site, the “Apple” category is the parent of the “Fuji” category which is a parent of the “Morioka” category. Good theme I am sure gonna use it on my new blog.